Turbulence is a subtle and multi-faceted phenomenon which touches many related areas and its study is widely considered one of the most important fields in classical physics. Recently, rapid progress has been made in the mathematical community towards understanding Onsager’s conjecture and anomalous dissipation. Meanwhile, new ideas have emerged from the turbulence physics community regarding spontaneous stochasticity, or breakdown of uniqueness of Lagrangian particle trajectories. Both of these developments are intimately related to applied topics, such as large-eddy simulation of turbulent flows, predictability of turbulent flows, and enhanced mixing by turbulence. Any significant progress towards true understanding requires close, cross-disciplinary collaboration and communication between the different areas involved. 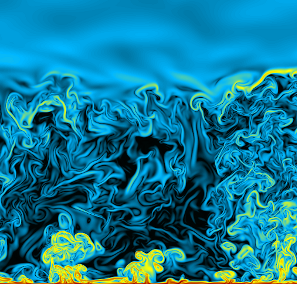 This workshop will bring together various communities working on the topics of turbulence, anomalous dissipation, and spontaneous stochasticity in incompressible fluid mechanics at high and infinite Reynolds number. The goal of this workshop is to increase the dialogue between these communities as the various fields are rapidly developing.